This has to be the BEST chocolate cake recipe, a chocoholics heaven!! This is not for the faint hearted... it is beautifully moist & gooey! 1. Grease a 20cm round cake tin (7.5cm deep) with butter and line the base. Preheat the oven to fan 140°C/conventional 160°C/ gas mark 3. Break the chocolate in pieces into a medium, heavy-based pan. Place in the butter, then mix the coffee formula into the pan. Warm the mixture over a low heat until everything is melted. 2. Whilst the chocolate is melting, mix the two flours, bicarbonate of soda, sugars and cocoa in a big bowl, getting rid of any lumps. Beat the eggs in a bowl and stir in the buttermilk. 3. Pour the melted chocolate mixture and the egg mixture into the flour mixture, stir until everything is well blended and you have a smooth and runny cake mixture. Pour this into the tin and bake for 1 hour 25 - 1 hour 30 minutes - if you push a skewer in the centre it should come out clean and the top should feel firm. Leave to cool in the tin, then turn out onto a wire rack to cool completely. Don't worry if it cracks a bit or if it dips slightly. 4. When the cake is cold, cut it horizontally into three, do not worry if the slice splits. Make the topping by chopping the chocolate into small pieces and tip into a bowl. Pour the cream into a pan, add the sugar, and heat until it is about to boil. Take off the heat and pour it over the chocolate. Stir until the chocolate has melted and the mixture is smooth. 5. Sandwich the layers together with just a little of the topping. Pour the rest over the cake letting it fall down the sides and smoothing to cover with a palette knife. Decorate with chocolate of your choice, grated chocolate or a pile of chocolate curls. v The cake keeps moist and gooey for 3-4 days. This is really bringing water in my mouth. Looks very yummy. Thanks for sharing the recipe. I will surely try this out. All time favorite Chocolate cake. 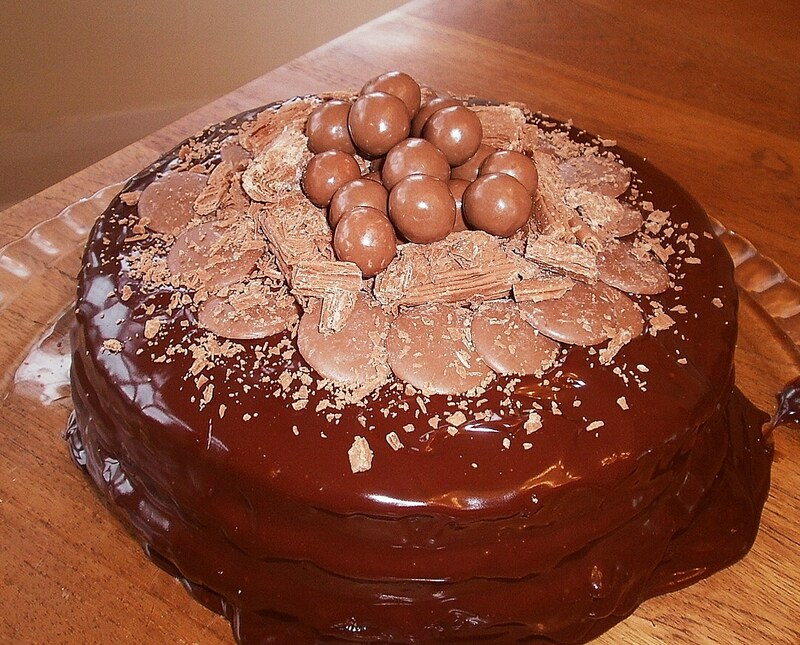 Thanks for sharing the methods of making a chocolate cake at home. I'll definitely try to make this in today evening.